Windows Presentation Foundation (WPF) provides a rich environment for creating applications. However, when you have a substantial investment in Windows Forms code, it can be more effective to extend your existing Windows Forms application with WPF rather than to rewrite it from scratch. A common scenario is when you want to embed one or more controls implemented with WPF within your Windows Forms application. 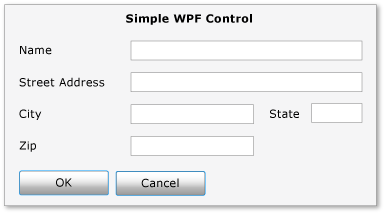 For more information about customizing WPF controls, see Control Customization. This walkthrough steps you through an application that hosts a WPF composite control to perform data-entry in a Windows Forms application. The composite control is packaged in a DLL. This general procedure can be extended to more complex applications and controls. This walkthrough is designed to be nearly identical in appearance and functionality to Walkthrough: Hosting a Windows Forms Composite Control in WPF. The primary difference is that the hosting scenario is reversed. The walkthrough is divided into two sections. The first section briefly describes the implementation of the WPF composite control. The second section discusses in detail how to host the composite control in a Windows Forms application, receive events from the control, and access some of the control’s properties. Implementing the WPF composite control. Implementing the Windows Forms host application. For a complete code listing of the tasks illustrated in this walkthrough, see Hosting a WPF Composite Control in Windows Forms Sample. 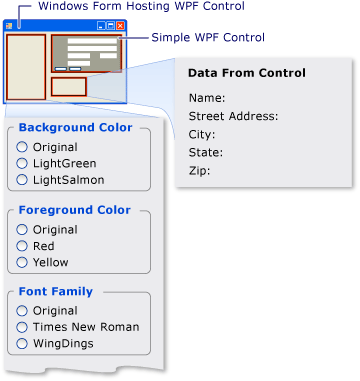 The WPF composite control used in this example is a simple data-entry form that takes the user's name and address. When the user clicks one of two buttons to indicate that the task is finished, the control raises a custom event to return that information to the host. The following illustration shows the rendered control. Launch Microsoft Visual Studio, and open the New Project dialog box. In Visual C# and the Windows category, select the WPF User Control Library template. Name the new project MyControls. For the location, specify a conveniently named top-level folder, such as WindowsFormsHostingWpfControl. Later, you will put the host application in this folder. Click OK to create the project. The default project contains a single control named UserControl1. In Solution Explorer, rename UserControl1 to MyControl1. Your project should have references to the following system DLLs. If any of these DLLs are not included by default, add them to your project. The user interface (UI) for the composite control is implemented with Extensible Application Markup Language (XAML). The composite control UI consists of five TextBox elements. Each TextBox element has an associated TextBlock element that serves as a label. There are two Button elements at the bottom, OK and Cancel. When the user clicks either button, the control raises a custom event to return the information to the host. The various UI elements are contained in a Grid element. You can use Grid to arrange the contents of the composite control in much the same way you would use a Table element in HTML. WPF also has a Table element, but Grid is more lightweight and better suited for simple layout tasks. The following XAML shows the basic layout. This XAML defines the overall structure of the control by specifying the number of columns and rows in the Grid element. In MyControl1.xaml, replace the existing XAML with the following XAML. You place a UI element in the grid by setting the element's RowProperty and ColumnProperty attributes to the appropriate row and column number. Remember that row and column numbering are zero-based. You can have an element span multiple columns by setting its ColumnSpanProperty attribute. For more information about Grid elements, see Create a Grid Element. The following XAML shows the composite control’s TextBox and TextBlock elements with their RowProperty and ColumnProperty attributes, which are set to place the elements properly in the grid. In MyControl1.xaml, add the following XAML within the Grid element. Many of the elements on the data-entry form have a similar appearance, which means that they have identical settings for several of their properties. Rather than setting each element's attributes separately, the previous XAML uses Style elements to define standard property settings for classes of elements. This approach reduces the complexity of the control and enables you to change the appearance of multiple elements through a single style attribute. The Style elements are contained in the Grid element's Resources property, so they can be used by all elements in the control. If a style is named, you apply it to an element by adding a Style element set to the style's name. Styles that are not named become the default style for the element. For more information about WPF styles, see Styling and Templating. The following XAML shows the Style elements for the composite control. To see how the styles are applied to elements, see the previous XAML. For example, the last TextBlock element has the inlineText style, and the last TextBox element uses the default style. In MyControl1.xaml, add the following XAML just after the Grid start element. The final elements on the composite control are the OK and CancelButton elements, which occupy the first two columns of the last row of the Grid. These elements use a common event handler, ButtonClicked, and the default Button style defined in the previous XAML. In MyControl1.xaml, add the following XAML after the last TextBox element. The XAML part of the composite control is now complete. Handles the event that occurs when the user clicks one of the buttons. Retrieves the data from the TextBox elements, and packages it in a custom event argument object. Raises the custom OnButtonClick event, which notifies the host that the user is finished and passes the data back to the host. The control also exposes a number of color and font properties that enable you to change the appearance. Unlike the WindowsFormsHost class, which is used to host a Windows Forms control, the ElementHost class exposes the control’s Background property only. To maintain the similarity between this code example and the example discussed in Walkthrough: Hosting a Windows Forms Composite Control in WPF, the control exposes the remaining properties directly. The code-behind file consists of a single namespace, MyControls, which will contain two classes, MyControl1 and MyControlEventArgs. The first class, MyControl1, is a partial class containing the code that implements the functionality of the UI defined in MyControl1.xaml. When MyControl1.xaml is parsed, the XAML is converted to the same partial class, and the two partial classes are merged to form the compiled control. For this reason, the class name in the code-behind file must match the class name assigned to MyControl1.xaml, and it must inherit from the root element of the control. The second class, MyControlEventArgs, is an event arguments class that is used to send the data back to the host. Open MyControl1.xaml.cs. Change the existing class declaration so that it has the following name and inherits from Grid. Declares a private event, OnButtonClick, and its associated delegate, MyControlEventHandler. Creates several private global variables that store the user's data. This data is exposed through corresponding properties. Implements a handler, Init, for the control’s Loaded event. This handler initializes the global variables by assigning them the values defined in MyControl1.xaml. To do this, it uses the Name assigned to a typical TextBlock element, nameLabel, to access that element's property settings. Delete the existing constructor and add the following code to your MyControl1 class. Creates a MyControlEventArgs object that contains the data from the TextBox elements. If the user clicked the Cancel button, sets the MyControlEventArgs object's IsOK property to false. Raises the OnButtonClick event to indicate to the host that the user is finished, and passes back the collected data. Add the following code to your MyControl1 class, after the Init method. The remainder of the class simply exposes properties that correspond to the global variables discussed previously. When a property changes, the set accessor modifies the appearance of the control by changing the corresponding element properties and updating the underlying global variables. Add the following code to your MyControl1 class. The final component in the file is the MyControlEventArgs class, which is used to send the collected data back to the host. Add the following code to your MyControls namespace. The implementation is straightforward, and is not discussed further. Build the solution. The build will produce a DLL named MyControls.dll. The Windows Forms host application uses an ElementHost object to host the WPF composite control. The application handles the OnButtonClick event to receive the data from the composite control. The application also has a set of option buttons that you can use to modify the control’s appearance. The following illustration shows the application. The following image shows a WPF composite control hosted in a Windows Forms application"
Launch Visual Studio, and open the New Project dialog box. In Visual C# and the Windows category, select the Windows Forms Application template. Name the new project WFHost. For the location, specify the same top-level folder that contains the MyControls project. You also need to add references to the DLL that contains MyControl1 and other assemblies. Right-click the project name in Solution Explorer, and select Add Reference. Click the Browse tab, and browse to the folder that contains MyControls.dll. For this walkthrough, this folder is MyControls\bin\Debug. Select MyControls.dll, and then click OK. The UI for the Windows Form application contains several controls to interact with the WPF composite control. Open Form1 in the Windows Form Designer. Enlarge the form to accommodate the controls. In the upper-right corner of the form, add a System.Windows.Forms.Panel control to hold the WPF composite control. Add the following System.Windows.Forms.GroupBox controls to the form. Add the following System.Windows.Forms.RadioButton controls to the System.Windows.Forms.GroupBox controls. Add the following System.Windows.Forms.Label controls to the last System.Windows.Forms.GroupBox. These controls display the data returned by the WPF composite control. You generally implement the hosting code in the form's Load event handler. The following code shows the Load event handler, a handler for the WPF composite control’s Loaded event, and declarations for several global variables that are used later. In the Windows Forms Designer, double-click the form to create a Load event handler. At the top of Form1.cs, add the following using statements. Replace the contents of the existing Form1 class with the following code. Create a new ElementHost object. Set the control's Dock property to DockStyle.Fill. Add the ElementHost control to the Panel control's Controls collection. Create an instance of the WPF control. Host the composite control on the form by assigning the control to the ElementHost control's Child property. OnButtonClick is a custom event that is fired by the composite control when the user clicks the OK or Cancel button. You handle the event to get the user's response and to collect any data that the user specified. Loaded is a standard event that is raised by a WPF control when it is fully loaded. The event is used here because the example needs to initialize several global variables using properties from the control. At the time of the form's Load event, the control is not fully loaded and those values are still set to null. You need to wait until the control’s Loaded event occurs before you can access those properties. The Loaded event handler is shown in the preceding code. The OnButtonClick handler is discussed in the next section. The OnButtonClick event occurs when the user clicks the OK or Cancel button. The event handler checks the event argument's IsOK field to determine which button was clicked. The lbldata variables correspond to the Label controls that were discussed earlier. If the user clicks the OK button, the data from the control’s TextBox controls is assigned to the corresponding Label control. If the user clicks Cancel, the Text values are set to the default strings. Add the following button click event handler code to the Form1 class. Build and run the application. Add some text in the WPF composite control and then click OK. The text appears in the labels. At this point, code has not been added to handle the radio buttons. The RadioButton controls on the form will enable the user to change the WPF composite control’s foreground and background colors as well as several font properties. The background color is exposed by the ElementHost object. The remaining properties are exposed as custom properties of the control. Double-click each RadioButton control on the form to create CheckedChanged event handlers. Replace the CheckedChanged event handlers with the following code. Build and run the application. Click the different radio buttons to see the effect on the WPF composite control.